Home » Investigations » Central » The World’s Most Economical Missile Programmes? I read this article and found it very interesting, thought it might be something for you. The article is called The World’s Most Economical Missile Programmes? and is located at https://archive.indiaspend.com/sectors/the-worlds-most-economical-missile-programmes-82336. The recent launch of the AGNI 5, the Intercontinental Ballistic Missile (ICBM) makes it a good time to look at how the DRDO (Defence Research Development Organization) is managing its finances and funding for ambitious projects. IndiaSpend’s Sourjya Bhowmick did a 10-year study of available figures and finds that DRDO’s seemingly achieves a lot with little. While we can’t establish direct time and cost correlations between the Rs 70,009 crore spend (including establishment costs) over a decade on DRDO and all the expenses on actually developing or testing missiles, it should come close. The fact is that for approximately $14 billion in 10 years, India has seemingly developed various kinds of missiles, drones, radar systems and all kinds of research and upgradation on armaments and fighting gear. Once again, both the UAV and the missiles may be chalk and cheese comparisons when it comes to capability and a host of other defence related parameters. So the idea is to provide contrasts, not compare in absolutes. On the other hand, the total value (Defence Ministry’s Annual Report 2011-2012) of the systems/technologies/ products that the DRDO has included in the defence services or is in the process of inclusion is computed at Rs 1,30,000 crore till now or $26 billion. The DRDO’s mandate is to design, develop and produce state of the art weapon systems and allied equipments for the defence services as well as provide technology solutions. This year its budget is Rs 10,636 crore, including salaries for its staffs and other miscellaneous expenses as well as the capital outlay. Heads like Pays and Allowances of Personnel, Stores, and Training is Rs 5,996 crore in 2012-2013. The Capital outlay, meant for modernisation and development, is effectively Rs 4,640 crore which is an increase of Rs 12 crore than Last year when it was Rs 4,628 crore. Interestingly, the actual expenditure of 2010-2011 was Rs 4,965. Thus, in 2011-2012 there was a decrease of Rs 337 crore. Let’s see what is budgeted to the DRDO for the last ten years, including the Capital outlay as well as the Revenue expenditure. The total amount budgeted to the DRDO in the last ten years is Rs 70,009 crore. Interestingly, the increase has not been great in the last two years. The increase in 2009-2010 and 2010-2011 is better largely due to the impact of Pay Commission which led to an increase in the pays and allowances of the DRDO. The accumulated increase of the last two years is Rs 828 crore. The following table will give you an idea of the capital expenditure of the DRDO in the past five years. In the last five years Rs 20,663 crore has been the capital outlay, meant for modernisation, upgradation of technology and other issues in this domain. The pension budget for the three services (Army, Navy, Air Force) in 2012-2013 is Rs 38, 973 crore. The salary budget for these services is Rs 55,838 crore. The Capital outlay for these three services in this year’s budget is Rs 57,893 crore just for the components like Land, constructions, Air-craft and Aero Engine, Heavy & Medium Vehicles and other constructions. DRDO’s Revenue expenditure on the other hand is paltry, which is normal keeping in mind their manpower. DRDO’s pays and allowances is only Rs 2,237 crore. Training gets Rs 15 crore. ‘Research and Development’ gets Rs 1,150 crore. However, the capital outlay is Rs 4,640 crore which seems a lot less than what they do and what they require. · Surface to Surface Prithvi II Missile was successfully flight tested, that too with accuracy on the 9th of June, 2011. We already have three versions of Prithvi with a range of 150 km, 250 km and 350 km. 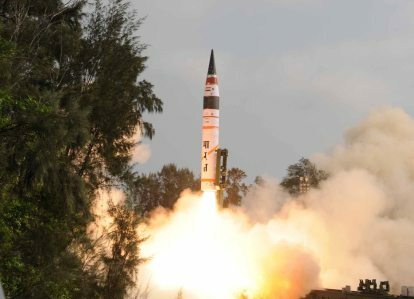 · Agni I successfully flight tested on December 1, 2011, Agni II on September 30, 2011, Agni IV test fired on November 15, 2011 and Agni V was successfully launched last week. · Long Range Surface to Air Missile (LR-SAM), a joint initiative between Navy and Israel is complete and under delivery. · Medium Range Surface to Air Missile (MR-SAM), initiative between Air Force and IAI, Israel developed. · Brahmos Supersonic Cruise Missile is developed for the Army, Navy and Air Force. Already installed in 4 ships and being installed in 5 more naval ships. Installation of Brahmos in Sukhoi 30 MKI fighter planes are in progress. · Astra Missile, indigenously developed is completed and flight trials on Sukhoi 30 MKI’s are completed. · Surface to Surface missile Prahaar successfully flight tested on July 21, 2011 and has achieved terminal accuracy. · Helina, anti tank missile for advanced light helicopter undertook a flight trial on October 17, 2011. · Shaurya Missile, with a range of 700 km was launched on September 24, 2011 and achieved accuracy. All these missiles have been successfully flight tested during the year. Prithvi, Shaurya are examples of a few missiles which have been upgraded from previous versions. Integrated Guided Missile Development Programme (IGMDP), another important agenda of the DRDO was the brain child of Dr APJ Abdul Kalam aimed at self sufficiency and got an approval in 1983. Agni, Prithvi, Trishul, Nag and Akash are the missiles that were completed under this programme. Finally, in January, 2008 the programme was closed as the goal of achieving self reliance in missile technology was achieved. Most of the achievements of this year are upgradation in technology, strength. · Medium Altitude Unmanned Aerial Vehicle (UAV) Rustom I was indigenously developed and have achieved successful flight tests. · Air Borne Early Warning and Control System (AEW&C) was indigenously achieved and took its first flight on December 6, 2011. It includes active electronic and radar scanning antenna and is considered to be a major milestone and Indian is now a part of the select countries that have this system. · Rohini, the Three Dimensional Surveillance Radar System was developed for the Air Force. It is built in accordance with the latest digital technology and will increase airspace awareness manifold. · Revathi, another surveillance radar system is developed for Navy with highly optimized structure and accuracy. These are a few important achievements of the DRDO in the year 2011. However, the list does not end here though. The specialty of DRDO lies on other aspects of the defence services as well. · Data Analysis and Pattern Recognition (DAPR) has been developed and handed to the Navy. It is to create a database which would analyse data mining and statistical testing. · Varuna, an interceptor have been installed and given to the Navy. It can detect, intercept the activity of 500 radar emitters simultaneously. · Stride, a convoy jammer system is developed and used by Army and Paramilitary. It can prevent detonation of radio controlled improvised explosive devices or IEDs. · 110 Arjun Tanks have been handed to the Army till now as compared to the 124 that was demanded previously. 90% of the Arjun Tanks are indigenously developed at the Indian Ordinance Factory in Avadi, Chennai by Combat Vehicles Research and Development Establishment (CVRDE), a wing of the DRDO. It is estimated to cost approximately Rs 2,500 crore. The remaining 14 tanks will be handed over by mid 2012. · Power output of T 72 tanks has been upgraded to 1000 hp, from 780 hp to enhance the mobility. · INSAS rifle and LMGs have been redesigned to increase lethality. Army has already carried out user trials. DRDO has been achieving its targets every year, which is evident if you take a look at the Ministry’s Annual Report 2011-2012 which spoke of the achievements of the year 2010. For instance, in 2010 the DRDO had successfully tested three missiles namely Dhanush, Akash and Nag. However there are allegations of time and cost overrun against the DRDO. For instance, a report says that the IGMDP was sanctioned Rs 389 crore for developing five missiles but till 2007, only two were ready and required an additional Rs 1,770 crore. With the stress on ‘buy and make Indian’ the push is on private Indian manufacturers, defence PSU’s. The technology for such measures is provided by the DRDO but with a small budget.